Start your Monday off with a smile as hopesmith, Kathryn Lang, leads her listeners to pursue the extraordinary. Focus on finding peace and joy by building a foundation of hope. Listen to good, positive, uplifting stories and interviews to encourage you in your pursuit of a peaceful life. Our station accommodates our listeners by archiving episodes so you can listen at your convenience. Kathryn C. Lang is a natural born Hopesmith that lives and writes in a little cabin in the woods in North Alabama. Her encouragement and support (and often her materials) come from her loving children and husband (and best friend for more years then either want to admit). Her passion for helping others find a life of peace and joy has provided her with opportunities to share her encouragement through her own experiences in words both written and spoken. Kathryn believes that each person has a unique purpose to fulfill. She desires to help others find their own path to that purpose and design. A life lived in purpose will be one filled with peace. Kathryn offers phrases of hope in order to shine the Light on the moment. She works through her columns, articles, books and workshops. 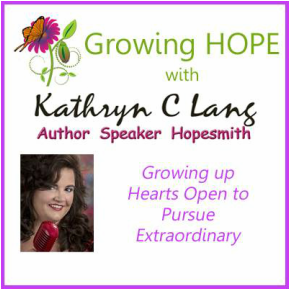 Are you interested in being a guest on Growing HOPE or having Kathryn speak at your event?